First Line: Emily Jarvis sat in her favourite battered armchair in front of the fire grinding her dentures together. 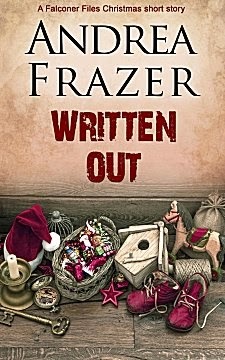 Having enjoyed the first Falconer File book so much, I decided to break the bank (a whole whopping 99¢) and treat myself to a Falconer File Christmas digital short story. The Christmas episode of popular television program Get One Over is to be filmed in Market Darley. While the contestants search for antiques and other valuable objects in the local shops, fans are gathering to rub elbows with the stars. Detective Inspector Falconer and Detective Sergeant Carmichael will both be there-- Carmichael because he loves the humorous commentator-- but Falconer has the exact opposite reaction to the star... and so do many other viewers. Although it was fun to see Market Darley decked out for Christmas, I have to admit that this story was a few pages too short. Just as I'd gotten settled in-- boom!-- it was over. Still, I did enjoy watching Falconer and Carmichael discover that some people take their television much too seriously! Cathy - I've read stories like that too - stories that were good and rich enough that they could have been longer. Still, glad you enjoyed this one. I really appreciate Frazer's sense of humor.